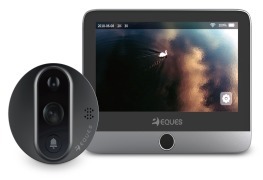 The Eques Smart Video Doorbell lets you answer the door from anywhere using your smartphone. It features an HD camera with night vision, providing a clear view from your front door day and night.The Eques Doorbell installs easily in minutes, with no professional help or additional tools required. Motion-triggered alerts sent via the free Eques app(iOS and Android) notify you of arriving guests and deliveries.Free Cloud Recording ensures you will never miss any activity at your home. With Eques, you are always home. FOR MORE INFORMATION CONTACT EQUES TECHNOLOGY CO., LTD.